First a note on the legality of this fossil. Alberta has very strict laws pertaining to fossil collection. 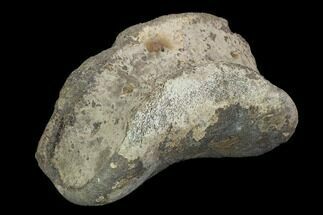 Fossils may not be removed from the province of Alberta without permission from the government. To gain ownership of a fossil, you must be issued a Disposition Certificate. Currently only a few fossil types are eligible for disposition. These include ammonites, petrified wood, leaves and fossil oysters. 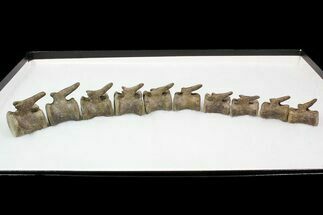 This specimen is part of a collection of dinosaur material that was collected by a single individual (Steve Walchina) decades ago prior to the current law. Because it was collected before the law went into effect, the collection was "grandfathered" in. 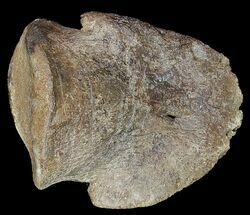 The collection was reviewed by the Royal Tyrrell Museum and a disposition certificate issued for portions of it that were not considered scientifically significant. 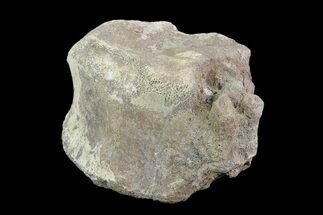 This moved the fossils into private ownership and allowed them to be removed from the province. 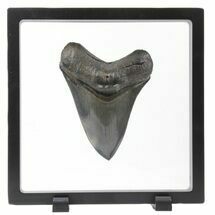 The disposition certificate (#000028-29) is on file with the Royal Tyrrell Museum. This makes the small amount of Alberta dinosaur fossils we recently acquired from this collection some of the only legal Alberta dinosaur material on the market. 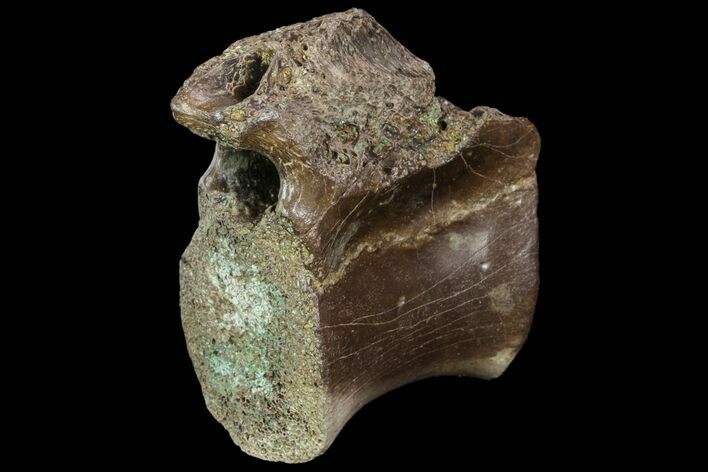 This is a 1.6" long cervical vertebra of an ornithimimid, theropod dinosaur, from the Drumheller Valley of Alberta, Canada. Ornithimimids are a group of theropod dinosaurs that in many ways resembled the modern day Ostrich. Following research of their bone structure, it's believed that ornithimimids were either omnivorous or strictly herbivorous, and they were likely very fast runners. 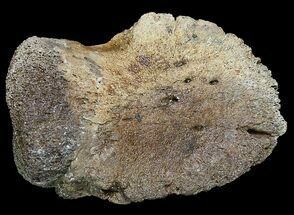 The vertebral process remained somewhat intact, however the process and both ends of the centrum have undergone significant weathering. There is a repaired crack through the process, as well as through the body of the vertebrae. 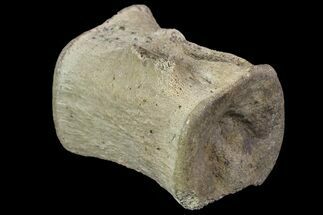 Other than that, the vertebra is in excellent condition.